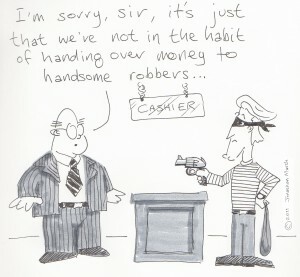 Turning your weakness into a strength; Why the best bank robbers are ugly. Watch any cheesy film where the hero has to fight insuperable odds and sure enough the turning point arrives when a sage advises the hero to turn their weakness into their strength. Outside the magic world of the cinema your instinct is probably to scoff at the cliche. But the thing about cliches is they become cliches for a reason. And the reason this cliche sticks around is because many of us are the Bruce Lee’s of finding our own weaknesses and converting them into an excuse to put a lid on our ambition. Most of these excuses are familiar and we deal with them in the book: Stop Talking, Start Doing. You know the sort of thing: Not enough money, wrong education, not enough time in the day etc. …and then I came across a new excuse in a report on the life benefits of your “looks”. Research by Daniel Hamermesh, professor of economics at the University of Texas at Austin showed that being good-looking helps you earn more money, find a higher-earning spouse, and get better deals on mortgages among other things. One study shows that if you are in the bottom 15% in looks – and yes, academics believe it is possible to classify people by something as subjective as appearance – then you will earn on average 10%-15% more than someone with an equivalent job but who is in the top 33% of looks. Men suffer more than women from look-ist discrimination. Hamermesh’s research shows that above average looking men earn 17% more than below-average men, whereas above average women earn 12% more than below average women. This is based on a study of just under 3,000 people. Hamermesh calls it the science of pulchronomics and says it applies across all industries: lawyers, economists, professors, sportsmen and yes – radio presenters. So what chance have you got if you’re not born pretty? How do you follow the advice of the wise old sage and turn your weakness into a strength? Thing is, there’s only room for so many bank-robbers in the world. And happily not everyone wants to go into this line of business. But if you think you might be suffering from a look-ist world and don’t want to rob banks then don’t think for an instant you have a bona-fide excuse to quit. And those are the ones that matter. «When there’s no crowd to follow, make your own map.